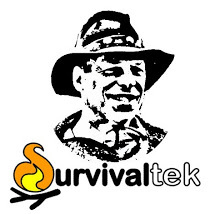 Survivaltek | Remarkable Stackble Wood Burning Camp Stove! One of the benefits of social media is the existence of groups of like-minded folk and in my case interests of bushcraft, camping, and survival. In one of the group feeds I learned of a stackable wood gasifer stove for camping that really appealed to me. After watching a few reviews on YouTube I decided to acquire one for myself. My source for purchase was on ebay. It was manufactured overseas and shipped from Chino California. I mention this for folks who are conscientious about their choice of manufactured goods and their origin. It shipped immediately and arrived 11 days later in North Carolina. It cost less than $16 with free shipping and handling. Once it arrived it was like Christmas morning! I opened up the package and was impressed with the compact dimensions. I quickly assembled the kit to get the full effect of it’s clever design. The next step was to try it out and experience it’s function in action. I have reviewed a different wood burning camp stove in a previous article entitled “Review – TrailStove“. It’s primary advantage over this stove is a side hole that allowed fuel to be added as needed without lifting the cooking vessel. However, this stove’s benefits are that it is a gasifier for more efficient combustion and that it collapses into a very small size for storage and transport. 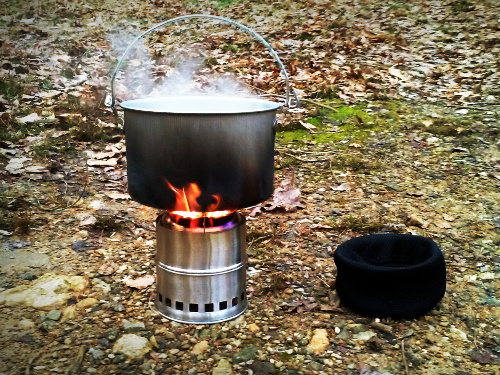 To sustain a fire during the cooking process the pot can be lifted momentarily as needed to add fuel. Another interesting feature of this stove is the adjustable pot supports on top; they can fold out to accommodate larger pots or folded inward to support a metal cup. It comes in a nice net bag that can isolate any soot when packed. My next action is to acquire a stainless steel pot with lid that this stove can nest inside for storage. I certainly give this a ‘thumbs-up” on my initial inspection and operation. this might just be the best fit for your backpack, Bug Out Bag, or emergency car kit. This entry was tagged BOB, Camping, Cooking, Gasifier, Stove. Bookmark the permalink.